Funtana has retained the appearance of a typical seaside village. Before turning to tourism, the natives were solely engaged in fishing and agriculture, since the sea that splashes the coasts of Funtana is rich in fish, and the soil is particularly fertile. This is also evidenced by the remains of the architrave of an ancient villa in Val Canelli, the nearby bay Valkanela, decorated with garlands -corollas made of leaves and fruits that hang on horns of ox skulls. And this is furthermore evidence of abundance. The village Funtana was developed on a hill right next to the castle and the parish church, which was built in the early 17th century by Bernardo Borisi, the lord of Funtana. Previous records regarding this village are mainly related to the port and nearby sources of fresh water according to which the settlement got its name. Back in the ancient times the place was called Fontana Georgiana, as proven by the documents related to the bishop Pacea de Vedano from Trieste (1331) who leased Funtana to the aristocrat Andrea Dandolo Veneto. The village is also mentioned as Val de Fontane – Fauntain Valley, Fontane di Pace – the Fauntain of Peace, and Portus Fontane – Fauntain Port. Between the border of the Vrsar Duchy, Val Fornazina and Val Sepera towards Poreč used to be located the Funtana Duchy – Contea di Fontane, since 1781 the county of Funtana, Distretto di Fontane. At the end of the 17th century P. Petroni had been staying in Funtana and in those days its castle was obviously the most important place of the village. According to his writings, it was built 4 miles from Poreč and a mile from Vrsar. Petroni left a nice present to the inhabitants of Funtana, a drawing of the village from the 1681. During summer droughts, both people from distant villages and the lodgers of the castle used to use the water from two fresh water springs next to the sea. They used to transport the water in barrels. During the high seas and when schirocco blew, the springs were flooded by sea water, but not long after the withdrawal of the sea the fresh water had the same excellent quality. Lots of the paths and side roads from the neighbourhood led to these springs. This part of Istria abounds with fresh water, the source of life. Nowadays, when a visitor comes to Funtana, he’ll notice a slogan: “Funtana, at the sources of friendship” – this saying reminds of the grapes of nature and of the warm hospitality of your hosts. The historians have recorded that during the 15th and the 16th century a lot of people died of malaria in this region. In order to maintain their fields, the owners inhabited the place with the refugees from the regions conquered by the Turks. Funtana was ruled by the Duchies Borisi from Kopar, who were newcomers from Bar, of the Duklja County. During the second half of the 16th century the authorities from Venice gave Borisi the licence to settle in Funtana. In the 1595 the Senate gave to the Borisi a formal authority over Funtana and in the 1648 the family had been given the title of hereditary Duchies. This had been confirmed by the emperor Franz I at the beginning of the 19th century. Thus, the Borisi have been the hereditary lords of Funtana until the abolition of feudalism in Istria in the second half of the 19th century. 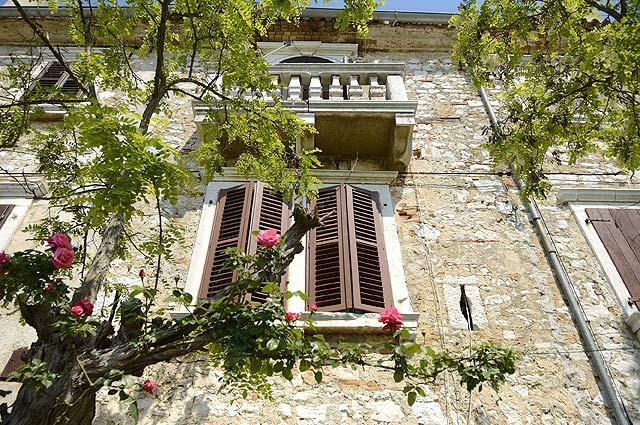 The aristocrat Bernardo from a noble Borisi family had a castle and a parish church built and the inhabitants started building homes around them: typical Istrian stone houses, inhabited by farmers and fishermen, who even start with seafaring and boat building. Today Funtana is a place, which is not narrowed to the area around the castle and the parish church. Family homes have been built on both sides of the main road connecting Poreč and Vrsar, and it is hard to find a family here that does not offer tourist accommodation under its roof during the summer. And one more thing: it is difficult to find another place in Istria where so many restaurants, taverns and café bars are situated in such a small region like Funtana. In this wonderful littoral, located between Zelena laguna in the direction of Poreč and Vlakanela in the direction of Vrsar, there are few campings and hotels with various gastronomic offers, and a sports and recreational one, too. This place is able to accommodate about twenty thousand guests in a single summer day. Funtana is an important tourist resort which is also proved by a special prize recently awarded: Funtana was proclaimed the most significant among small tourist resorts on the Adriatic. Its people are hard workers, they love their region and their village which is obviously changing its image day by day. To the joy and happiness of the holiday-makers, and their guests, too.